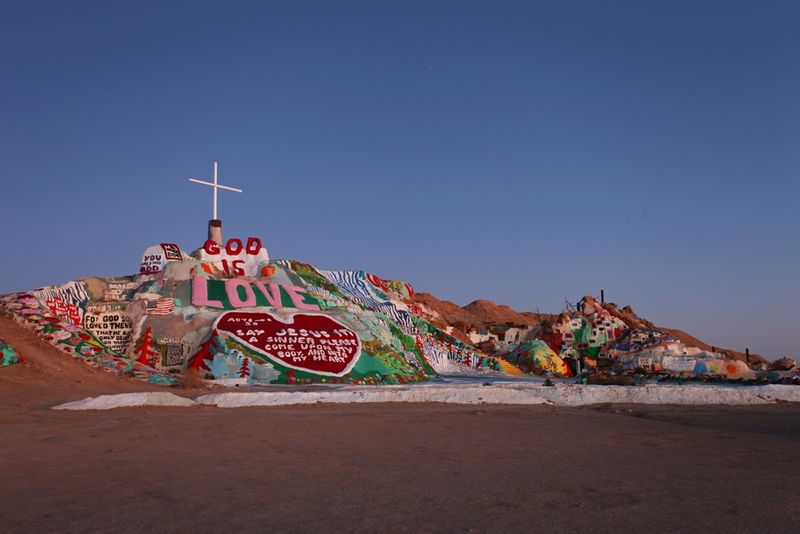 Salvation Mountain An incredible folk art construction relating God's message of love in southern California. This is looking straight on at sunset. 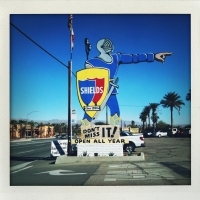 Deep in the Imperial Valley, in the left behind acreage of an old military base, lies a place called slab city, an off the grid impromptu RV camp. It’s full of old slabs of concrete – hence the name – where people spend the winter. 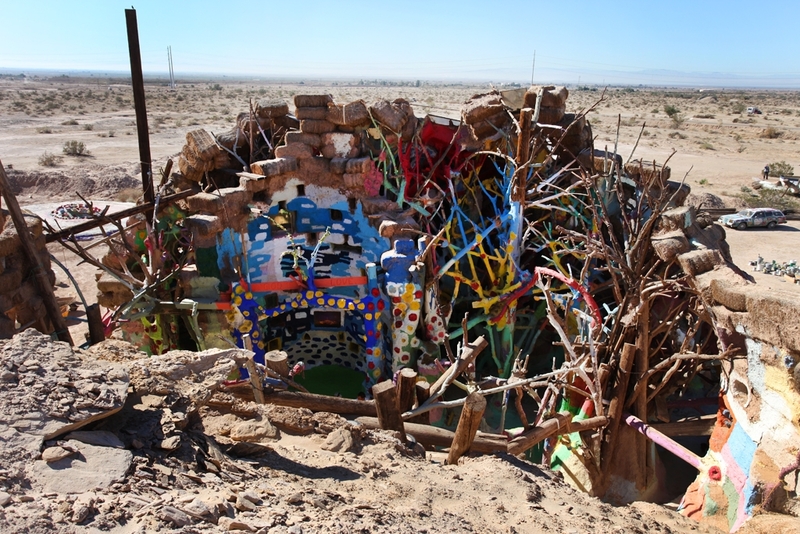 Acting like some kind of pearly gate to this nomadic haven is Salvation Mountain. 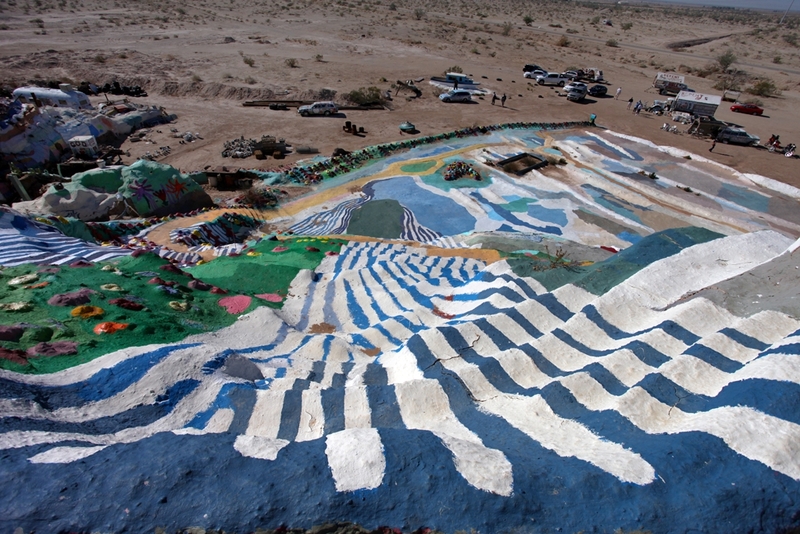 Created by the extremely affable Leonard Knight, Salvation Mountain is probably more of a hill, but over the last 30 years he has augmented it with adobe and found junk and about 100,000 gallons of paint. 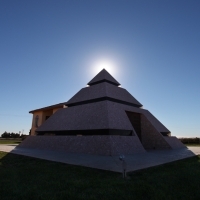 It is a 3 story monument to the message that “God Is Love” and covered with biblical quotes. Salvation Mountain Water These stripes kind of look like water but I found them to be mesmerizing to look at the way they sort of wrapped themselves to the contour of the mountain. In addition to the mountain, there is also a sort of catacomb area made of old trees and logs covered in more adobe and paint that is not easy to describe, but imagine being inside of a 30 foot tall rainbow colored neural synapse room and that starts to get at the experience. the upper parts of the walls let light in thorough old bus windows he has fused into the adobe. We must have spent 2 hours here and probably could have spent more, there are just so many details that draw you in, from the graphic designs of the mountain that create different patterns when you stand in different areas, to the vehicles that are covered in paint, to Leonard himself. Catacombs in Progress This shows the catacomb area in progress and kind of gives you an idea of how it is constructed. We actually went twice, once at sunset and once again in the morning. At sunset the place is much more subtle, certain parts of it stand out more, and the catacombs almost become spooky. Whereas in the day time the colors are overwhelming, at first you don’t even know where to look. If this all looks kind of familiar, many people know this place from the movie Into the Wild, which also briefly features Leonard. There are also some cats here to pet if you really need a cat petting fix like Alana usually does.